were the texture and the colors. ivory, cream and beige to go with my Winter White theme. difference in the look of the rosette. and about 40" long while the rosette on the right is made from a strip of felt 2" wide and about 20" long. a rosette with more detail. I think it is prettier. If you are in a hurry or want a thicker rosette, go with a wider strip. fabric 1" wide and the larger one's strip was 1.5" wide. They look like cinnamon rolls, don't they? 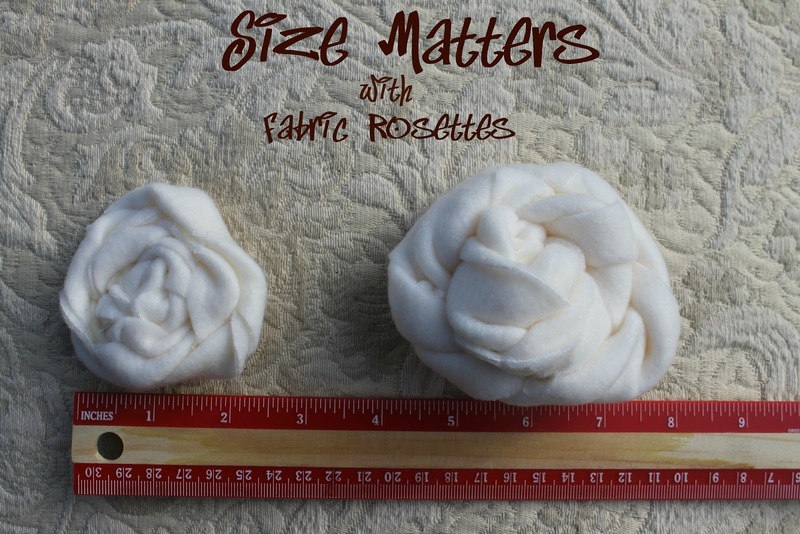 The length of the strip of fleece for both is 22" but the width of the smaller one is 1 1/4"
you don't want a rosette with the frayed look, those would be good fabrics to use. with a 4" wide strip. Both the flannel strips were 22" long. be better so that they would be soft. This is a photo of the underside of some of the hand-sewn flannel rosettes. I had cut a pile 2" X 22" strips of flannel to hand sew while I would be waiting in a doctor's office. for the rest of the rosettes when I got home. rosettes, play with their placement before attaching them. dried hot glue might make the center of the pillow hard. bottom like a lot of tutorials instruct. It would be hard to get the needle through the dried glue. to cut to make my favorite ones. Ah ha ha ha ha.... sure the rosettes are great, love 'em, but yeah it was the post title that caught my attention. Thanks for the links! Your pillow turned out lovely. Love the rosettes. I think they all turned out looking great. These are so pretty! I have never seen them before. What a great post! Love how the pillow turned out! Would love for you to link up to our Uncommonly Yours link party! I love the information about the different sizes and gluing versus sewing, and thanks for linking to cowgirl up. Good to know...I haven't made these yet but I have them on my want to make list! Thanks for sharing on the Rock 'N Share!